As with so many other aspects of human life, the economics of our world will be going through extraordinary changes during the rest of this new century and beyond. And just like the changes in the personal, social, and political spheres, economic changes will be largely driven by new and evolving technologies. This module delves into the major forces that will be driving those changes in the twenty-first century. Already we have seen massive changes in the environment in which business exists. In the same way that the era of the unbridled robber barons came to an end a hundred years ago, so now their legacy is finally reaching the end of its afterlife. The belief in zero-sum economics is beginning to die of neglect, and is being replaced by other more sane and successful models. Look, for example, at some of the biggest and most successful technology companies in recent times. They come in two basic flavors. The first is a kinder, gentler variant of the robber barons, who still see business as a kill or be killed affair. The other is a new generation of business thinkers and entrepreneurs, who are just as interested in making money, but don’t see doing damage to others as a viable approach. These people want to do something wonderful and trust that if they do it well, they will make a whole bunch of money. As examples of the first class of businesses you have Microsoft, Apple, and Oracle. Their law-of-the-jungle approach to business has allowed them to build financial and technological empires that until very recently were virtually unprecedented. But the latest crop of entrepreneurs are cut from a different bolt of cloth. This class of business people are following a dream that they believe will create a better world for everyone, which certainly includes themselves. This is not to say that the Bill Gates and Steve Jobs of the world don’t have dreams of making the world better, too. But their dreams are centered on what’s good for me is good for the world. While the other type believes that what’s good for the world is good for me. In this second group you have companies like Google, Amazon, and Ebay. These people all have goals that began as a dream for empowering individuals the world over, and oh yes, if we are successful, we will get richer than all get out. The likes of Sergey Brin, Larry Page, and Pierre Omidyar are more focused on promoting personal empowerment of other people than they are at consolidating their own personal empires. In this module we will explore in depth these and other major evolutionary developments that will shape the future of economics on a planetary scale. The economies of every country on Earth are now interdependent. When America sneezes, Europe says “gazuntite,” and Asia reaches for the cold pills. How is our economic world going to change in the future? Our ability to collaborate is growing at an astonishing rate, both physically and virtually, and with it our ability to conduct commerce of all kinds on a global scale. Be ready for a lot more of it as the century unfolds. What are the prospects for countries whose economies are just beginning to develop? How will they affect the nations who are already more developed? How will it all work out over the next several decades? There are no answers, but there are informed guesses in this chapter. There is always talk about the inequities in the distribution of wealth, but what are the facts, and what are the solutions in the decades to come? 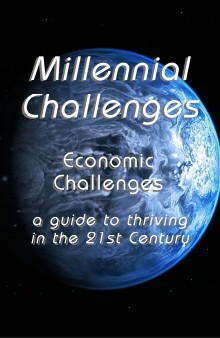 This chapter offers insight and potential solutions. How will people make a living as the new century unfolds? What kinds of education will they need? What of those who don’t have access to schools? These questions and more have answers, and some of the best are in this chapter. The advance of technology, especially the Internet, has brought forth many new says for businesses to make a profit. There are also modifications to existing models. This chapter describes the larger framework and projects it into the future. Around 200 years ago, people deserted their farms to live in cities and work in factories. Now, thanks to telecommuting, the reverse trend is starting to be felt. Where can we expect this process to go next? No longer are traditional banking and financial institutions the only game in town. Nowadays there are numerous alternatives that are available to people who have never had access before. Read about this powerful trend in this chapter. The very concepts of protecting ideas, creations, and inventions is beginning to experience a massive redefinition. What are the real issues, and where might they be going in the remainder of this century? No one likes economic instability. The very notion of wild swings in incomes, prices, and jobs is upsetting for all, and terrifying for many. In this chapter the roots and solutions of these gyrations is explored in depth. To purchase and download this book click here.